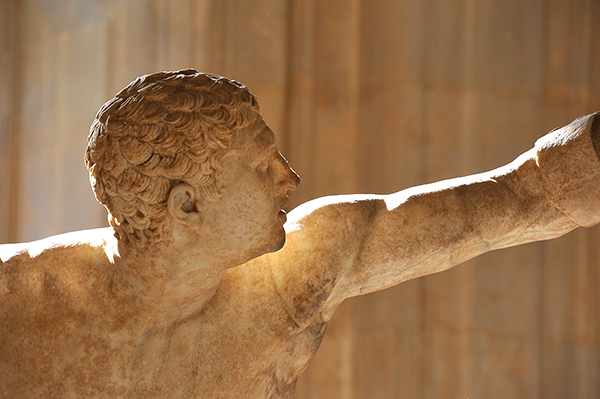 This statue of a warrior is signed by the first-century BC sculptor, Agasias of Ephesus. First recorded in 1611, just after it had been found, it was in the Borghese villa by 1613, where it was regarded as the most admired work of antiquity in the collection. Indeed, so many casts were taken that further copies were prohibited. In 1807, it and most of the other Borghese antiquities were purchased by Napoleon, whose sister was married to Prince Camillo Borghese. One can see the remnant of a shield held high on the left arm and, in the right hand, that of a sword. Although known as the Borghese Gladiator, the warrior would seem to be a foot soldier combating a mounted opponent. 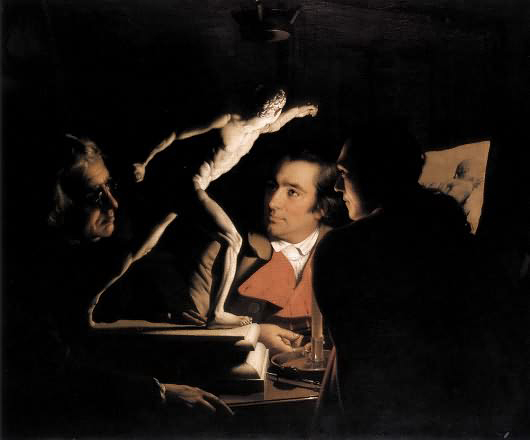 In Three Persons Viewing the Gladiator by Candlelight (1765) by Joseph Wright, connoisseurs regard a model of the Borghese Gladiator, a drawing of the statue behind them. Several years later, Sir Joshua Reynolds, first president of the Royal Academy of Arts, expounded to its students on the moral and intellectual benefit of such contemplation. "It is not in the Hercules, nor in the gladiator, nor in the Apollo; but in that form which is taken from them all, and which partakes equally of the activity of the gladiator, of the delicacy of the Apollo, and of the muscular strength of the Hercules. For perfect beauty in any species must combine all the characters which are beautiful in that species. It cannot consist in any one to the exclusion of the rest: no one, therefore, must be predominant, that no one may be deficient." Reference: Seven Discourses on Art (1771) by Sir Joshua Reynolds.